Click chart for more of today's market action. NEW YORK (CNNMoney) -- U.S. stocks ended a gut-wrenching session with huge gains -- erasing a big chunk of the prior session's steep losses -- after the Federal Reserve said it will keep interest rates exceptionally low until 2013. The Dow Jones industrial average (INDU) rallied 430 points, or 4%. The S&P 500 (SPX) added 53 points, or 4.7%; and the Nasdaq (COMP) gained 125 points, or 5.3%. Immediately following the Fed's statement, the major indexes all briefly slid into the red -- with the Dow dropping more than 200 points. 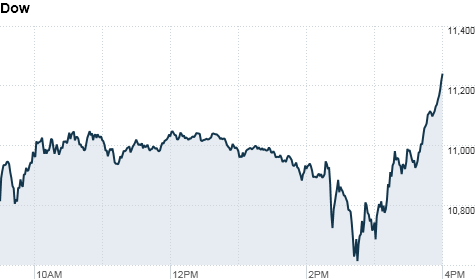 The Dow fluctuated by more than 600 points during Tuesday's session. In its latest monetary policy statement, the Federal Reserve left key interest rates unchanged, saying that deterioration in the labor market and slower-than-expected economic growth will require the central bank to keep rates "exceptionally low" until the middle of 2013. A survey of investors conducted by investment firm Nomura before the Fed's statement showed that 22% of market participants had been looking for the Fed to announce more quantitative easing to help prop up the economy. "It's hard to know what this means and how we should react," said Stephen Leeb, president of Leeb Capital Management. "It's disappointing they didn't announce further Treasury repurchases, but they did announce that rates will stay low for two years -- which is a big deal." Knowing that rates will stay low for at least two years adds certainty to an otherwise uncertain economic environment, said Leeb. "It means business owners can hire employees, and people can take out mortgages without having to worry about a spike in short-term interest rates," he said. U.S. stocks have fallen more than 10% in the last month, and Monday's beating was by far the most brutal session. Stocks posted their worst losses since the 2008 financial crisis Monday, in the aftermath of S&P's downgrade of the U.S. credit rating. So given those sharp declines, it was almost inevitable that markets would ultimately end higher Tuesday, said Sal Arnuk, co-founder of Themis Trading. Since 1927, there have been 31 one-day declines like the 7% drop in the S&P 500 seen Monday, he said. And of those instances, the S&P turned positive the next day 79% of the time. But that doesn't mean investors aren't still rattled by the struggling U.S. economy and the European debt crisis. "I've still got my helmet on," Lee Smith, vice president of Cozad Asset Management said. "The sell-off yesterday was overdone, so I'm starting to dip one foot back in the market -- but confidence is so weak right now, I don't have both feet back in yet." All three major indices sank between 5% and 7% Monday, pushing the Dow below 11,000 for the first time since last November. The sell-off, which amounted to a paper loss of about $1 trillion, was worse than the 512-point drop stocks experienced just three trading sessions before. Big movers: Bank stocks were among the hardest hit during Monday's slide -- with Bank of America shares tumbling 20%, after AIG (AIG, Fortune 500) said it is suing the bank for billions of dollars over mortgage security fraud. But Bank of America's (BAC, Fortune 500) stock recouped most of those losses Tuesday, with shares closing 17% higher. Other financial stocks such as JPMorgan Chase (JPM, Fortune 500) andAmerican Express (AXP, Fortune 500) rebounded about 7%, and Citigroup (C, Fortune 500) soared more than 14%. Gains spilled over to the broader market, with all 30 of the Dow's components ending in the green. Boeing (BA, Fortune 500) and Alcoa (AA, Fortune 500) were among the biggest winners Tuesday -- both rising more than 6%. Currencies and commodities: The dollar was lower against the euro and Japanese yen, but rose versus the British pound. Oil for September delivery slid $2.01 to settle at $79.30 a barrel. Gold futures for December delivery gained $29.80 to settle at $1,743 an ounce. Earlier, gold prices hit a record intraday high of $1,782.50 an ounce. Bonds: The price on the benchmark 10-year U.S. Treasury rose following the Fed's statement, pushing the yield down to 2.18% from 2.34% late Monday. The U.S. Treasury Department plans to sell $72 billion in bonds this week. Its first auction was held Tuesday, during which the government sold $32 billion in 3-year notes. The bid-to-cover ratio, a measure of demand, came in roughly in line with other recent 3-year note auctions -- an indication that investors are not afraid to stash their money in Treasuries, even with the warning from S&P. World markets: European markets finished mixed. Britain's FTSE (FTSE) 100 gained 1.9% and France's CAC (CAC) 40 jumped 1.6%, while the DAX (DAX) in Germany dipped 0.1%. Asian markets were also volatile, but ended in the red. Japan's Nikkei dropped 1.7%, but was well off its lows at the close. A late sell-off pushed the Hang Seng in Hong Kong down 5.7%, and the Shanghai Composite was just below breakeven. Economy: Productivity of U.S. workers slipped 0.3% during the second quarter, after falling 0.6% the prior quarter. Labor costs rose by 2.2%. Companies: AOL (AOL) reported a bigger-than-expected quarterly loss early Tuesday -- driving shares of the media giant 11% lower. After the closing bell, Dow component Walt Disney (DIS, Fortune 500) will head to the earnings stage. The media giant is expected to report a profit of 73 cents a share.